Cho, Dongsun. St. Augustine’s Doctrine of Eternal Punishment: His Biblical and Theological Argument (New York: The Edwin Mellen Press, 2010), 232 pp. It may rightly be said that Augustine is to heretics what Plato is to postmodernists. Augstine’s systematicity and precision of thought are anathema to heretics, whose existence largely depends upon a rejection of systematicity and precision as they pertain to the doctrine(s) under consideration. As the postmodernists reject the systematic interrelatedness of philosophical doctrines, so the heretics reject the systematic interrelatedness in Scripture. Over the past century, many theologians have sought to deconstruct the systematic teachings of the Scriptures, typically attributing the doctrines they don’t like to Augustine, whom they claim was a Platonist. Theological deconstructionists, ironically those who most openly claim they are restoring a true teaching to the church, have an easy target in Augustine. He published an immense body of writing on a wide assortment of subjects, which makes reading through the entire Augustinian canon a herculean task for the non-academic. Not only this, but for those who manage to do so, they will soon note that Augustine is not always consistent. His writing spans the entirety of his life as a Christian, with his earlier writings being influenced in some ways by the Platonists, and his later writings conforming to the teaching of Scripture. Ignoring the immensity of the Augustinian canon, as well as the inconsistency one encounters therein, heretics paint Augustine as a Platonist whose commitment to Plato’s philosophy (by which we must assume his accusers mean Plato’s metaphysics) tainted his otherwise helpful sermons and books. This is done in order to dismiss two unpopular biblical teachings for which he offered very strong arguments, viz. the immortality of the soul and eternal punishment (or everlasting conscious torment, ECT hereafter). 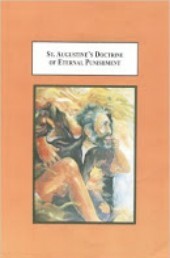 Dongsun Cho’s St. Augustine’s Doctrine of Eternal Punishment: His Biblical and Theological Argument, thankfully, scrutinizes the claims of those who dismissively identify the doctrines of the immortality of the soul and ECT as the fruit of Platonic philosophy, particularly as Christianized through Augustine’s writings, and finds those claims to be false. Cho argues that Augustine’s doctrine of ECT and doctrine of the immortality of the soul are derived from a systematic approach to interpreting the Scriptures. Cho not only demonstrates that Augustine was not a Platonist, and that, therefore, his doctrines were not derived from the Platonism of his day, but he also shows that Augustine’s hermeneutic is not simply literal or simply figurative, as some non-traditionalists assert. Rather, Augustine carefully balances literal and figurative readings of the Scriptures, according to hermeneutic principles he expressly sets down in texts like De Doctrina Christiana and Enchiridion. Cho helpfully presents Augustine in an historically accurate light, confuting “non-traditionalists” like Edward Fudge and Clark Pinnock who wrongly believe that Christian belief in the immortality of the soul and ECT began with Augustine.